Vegan Desserts, Desserts without milk, butter, cheese. 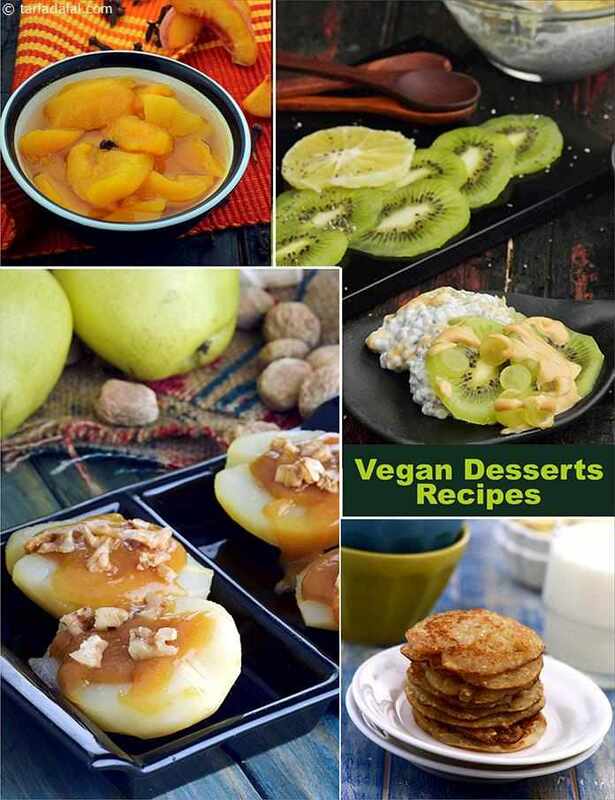 It is better to prepare Vegan desserts at home rather than buying from outside because you never know whether they’ve used ghee or any other non-vegan ingredient. And you can always customize them according to your preferences without the use of dairy products and eggs. This section will help you explore the world of desserts and try your hand at traditional and innovative ones. Try our cocoa powder, coconut oil based Chocolate Coconut Dessert. Coconut oil and Coconut butter are super ingredients and combine to make an awesone rich dessert. Then there is the Almond Berry Coconut Cake made of healthy fat for athletes. Try the Banan Sesame Pancake for deseert and serve with Maple Syrup. Also the Indian Jaggery Pancake is rice flour based and great in taste. Try our desserts recipes to fulfill your sweet cravings. From Pastries Vegan Chocolate Fudge Pastry to Pear Rabdi with Oats Milk we’ve got you a wide range of desserts to choose from. Pista Barfi is one of our favorites as it’s got a mild flavor with an attractive green color. We also have recipe for fruit lovers e.g. Apple Cups with Fresh Fruits.